A successful long-distant moving experience requires good planning as well as flexibility. From the very first phone call you make to Able Moving to the day of your Interstate move, we leave nothing to chance. We stay in close contact with you throughout the entire process, including move day. At Able, our goal is to provide excellent, stress-free services at an affordable rate. From the free, no-obligation, in-home estimate, to pad wrapping all of your furniture before it leaves your home, our dependable long-distant movers are trained to treat your belongings like their very own! 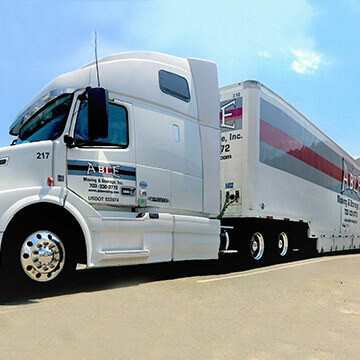 Able Moving and Storage uses a fleet of late model tractor trailers to transport customer belongings across state lines. Because Able Moving is an independent mover, the only limitations to consider are the geographical regions that Able Moving serves. Able Moving is based out of Manassas, Virginia, and serves the entire eastern seaboard from Maine to Florida and as far west as Texas. Because Able Moving travels within a set radius, there is a strong likelihood your shipment delivery will take less time than a traditional van line, which has to wait for several shipments to fill out the truck. Besides our reputation for quality, one of the main reasons customers choose Able moving is because Able moving will assign the same Team leader and Helper(s) from start to finish. There will never be any day labor or street corner help on an Able truck. We only use professional, trained, uniformed crew on every truck. The success of your move is our highest priority! That’s why we handle it all ourselves, from the first phone call to the completion of your move.